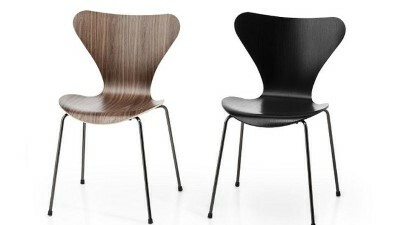 Arne Jacobsen was a Danish designer. The design world was highly influenced by his work with furniture. Arne Jacobsen was born in Copenhagen in 1902. He began his career as a mason before studying architecture at the Royal Danish Academy of Fine Arts. After receiving his diploma he went to work at Paul Holsøe's architecture office, where he produced several original creations. In 1929, he won a competition to design the "House of the Future". He created his own agency in 1930, allowing him to design numerous projects in architecture, decoration, furniture, textiles and ceramics. Arne Jacobsen produced several quality items of furniture, with his biggest success being the Ant Chair. Created in 1952, this slim chair was modelled on an organic and minimalist drawing. It was orignally designed to furnish the canteen of the pharmaceutical company Novo Nordisk, but later became available to the general public. This is a well-rounded chair molded in a single piece of pywood. Light and comfortable, it is stabilised by its steel legs. The Ant Chair brought Danish design to the centre stage. It allowed Jacobsen to present refined Scandanavian style to the world. Since its invention, more than five million copies of this chair have been sold worldwide. Numerous contemporary designers have revisted this ever-fashionable style. The works of Arne Jacobsen continue to surprise fans of designer furniture with their simplicity and style.